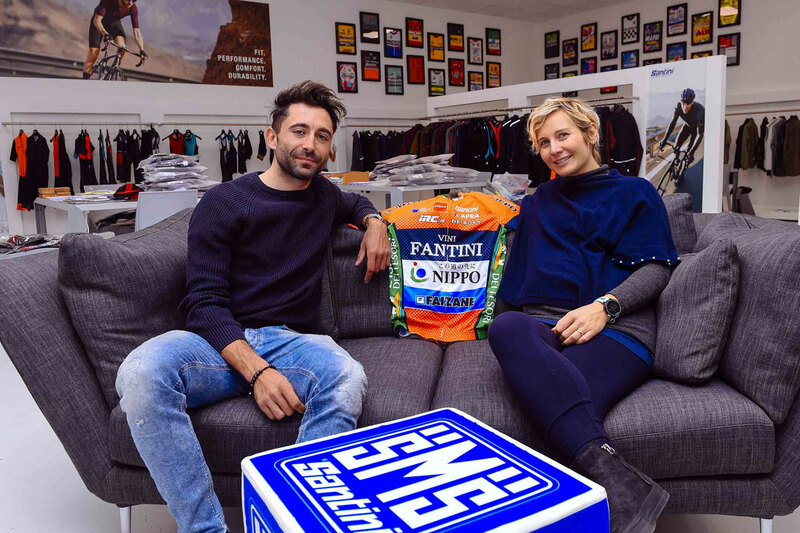 Santini Cycling Wear’s partnership with the Italian-Japanese NIPPO Vini Fantini Faizanè team is to continue for a second year with the Italian brand official supplier of the team’s competition kit and a whole collection of personalised garments designed to meet their needs throughout the seasons. The competition kit, which was unveiled at the meeting in the company, has been redesigned. 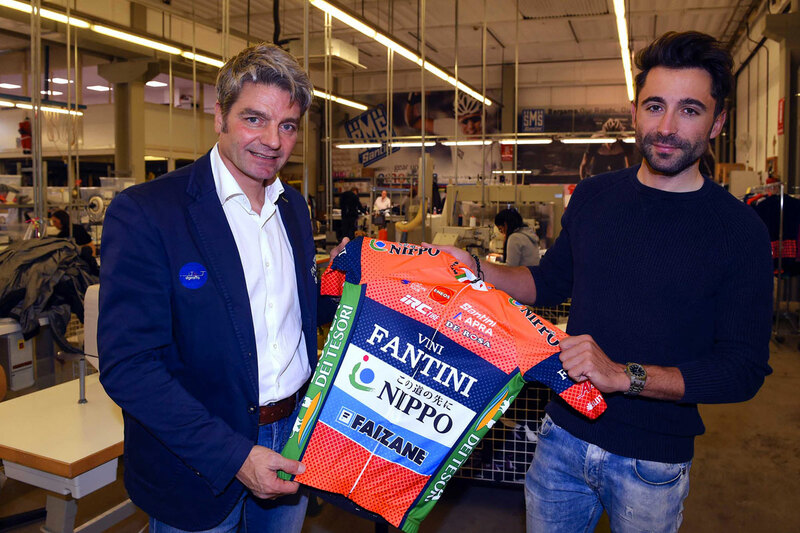 The team’s signature #OrangeFluo has returned as the main colour of the jersey while the centre stripe and the sleeves with the Vini Fantini logo remain navy blue. A rhomboid pattern also adds both texture and different shades to various areas. The bib shorts are navy blue, creating an elegant two-piece kit. From a technical perspective, the jersey is the classic slim fit cut demanded by elite athletes. The front is made from extremely breathable Kenobi fabric with an elastic blend at the back. The sleeves are raw cut and made from aerodynamic, body-hugging Bodyfit. The bib shorts are made from Thunderbike Power which exerts a gentle compression on tired muscles, with side sections in the customisable Lycra Monica. The chamois pad is the top-of-the-range Santini C3, which guarantees superb comfort, lightness and shock absorption thanks to Santini’s signature Carving technology. Aside from the main kit, the team will also be supplied with a full collection to allow them tackle all the challenges they encounter throughout the year, training sessions included: winter bibtights, jackets and accessories, and rain wear are just a few examples of the apparel made in the team colours and sporting its logos. 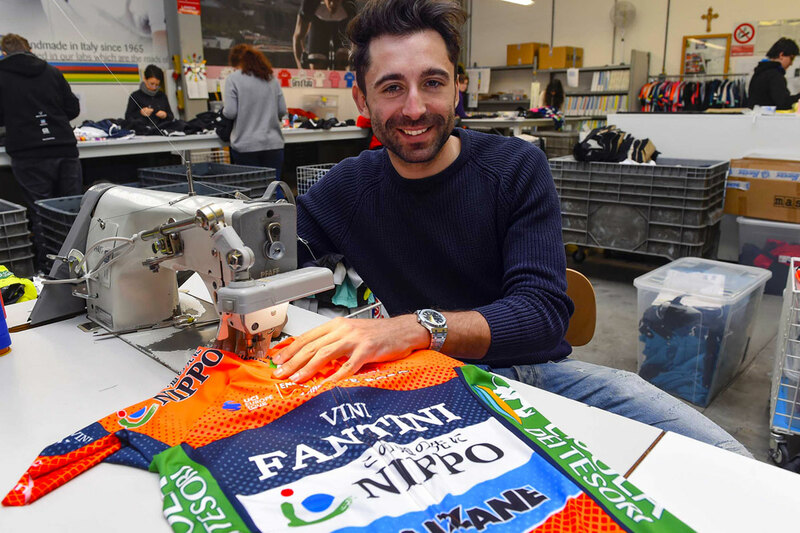 Santini chose to base the latter on the new Custom collection and they are available to all amateur cyclists also. Replicas of the official kits will be available from the santinisms.it website and select cycling stores worldwide.